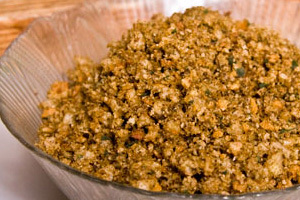 It’s easy to make high quality bread crumbs at home from leftover baguettes. 1. Toast the baguette in a 350 degree oven until very crispy and crumby. 2. Remove the baguette form the stove and let it cool until it is safe to handle. Roughly slice it into thick rounds. 3. Put the baguette rounds in a food processor. Blend until reduced to bread crumbs.